The model for this composition was Lydia Delectorskaya, a beautiful young Russian émigré who worked closely with Henri Matisse during the last twenty years of his life. 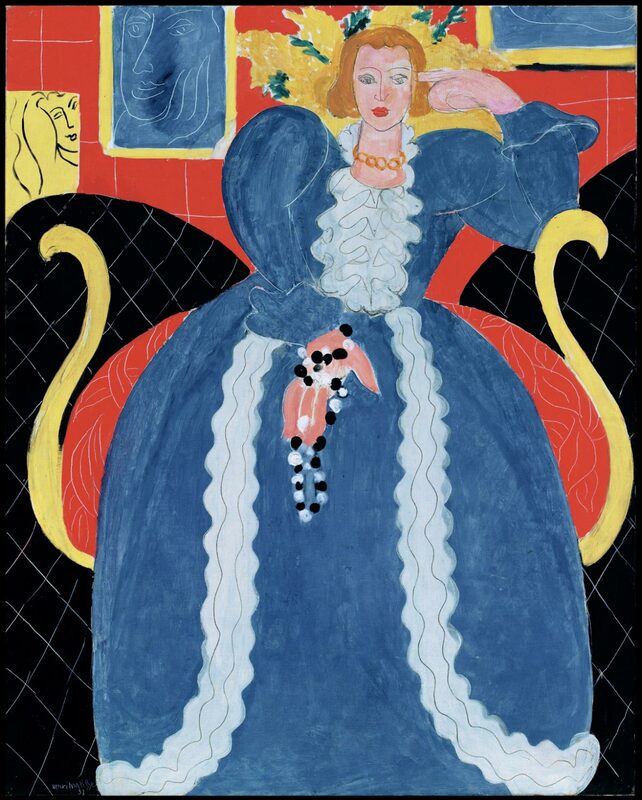 Delectorskaya designed the dress shown here after Matisse purchased the sumptuous violet-blue fabric in Paris. The resulting concoction, held together by loose stitches and pins, was intended only for use in Matisse's studio in Nice and appears in several of his paintings of this period. The model for Henri Matisse's Woman in Blue was Lydia Delectorskaya, a beautiful young Russian émigrée who worked for the artist during the last twenty years of his life. Like many of the portraits Matisse painted in the late 1930s, this work focuses on a dramatic costume rather than on the personality of the sitter. Using fabric that Matisse had bought in Paris, Lydia made the sumptuous violet-blue dress herself. The resulting concoction, which appears in several paintings of this period, was intended to be worn only in the studio and was held together by loose stitches and pins. The artist considered Woman in Blue his best picture of 1937, and, indeed, the simplicity of the composition is striking, with its restricted palette of red, yellow, blue, black, and white. Ten photographs (now in the Museum's archives) taken over the three months that Matisse worked on the picture prove that this was a hard-won solution. The first version of the picture shows a relatively naturalistic composition of a woman leaning to her side, and is full of much greater detail and depth. Only gradually did the present state of the painting evolve, with its flat picture plane, Lydia's rather inexpressive face, and her boldly exaggerated right hand encircled in beads. Melissa Kerr, from Masterpieces from the Philadelphia Museum of Art: Impressionism and Modern Art (2007), p. 144. The sitter for this painting was Lydia Delectorskaya, a Russian woman who had frequently posed for Matisse since the early 1930s. It is one of many portraits of the late 1930s in which Matisse focused on a dramatic costume rather than the personality of the model. The simplicity of the composition is striking, with a palette of only red, yellow, blue, black, and white. A seemingly casual harmony exists among the many billowing curves, the background grids, and the three drawings on the wall. Yet ten photographs taken over the three months that Matisse worked on the picture (now in the Museum archives) prove that this was a hard-won solution: the first version of the picture shows a relatively naturalistic composition of a woman leaning to her side, full of much greater detail and depth. Only gradually did the present state of the work evolve, with its absolutely flat picture plane, rather inexpressive portrayal, and the boldly exaggerated right hand encircled with beads. Ann Temkin, from Philadelphia Museum of Art: Handbook of the Collections (1995), p. 325. Like many of the portraits Matisse painted in the late 1930s, this work focuses on a dramatic costume rather than the personality of the sitter, whose features have been flattened and simplified with no interior modeling. The artist considered Woman in Blue his best picture of 1937, and, indeed, the simplicity of the composition is striking, with its palette restricted to red, yellow, blue, black, and white. A casual harmony exists among the many billowing curves of the model's dress, the background grids, and the drawings behind her on the wall. To articulate the background and the sleeves of the dress, Matisse scraped linear patterns into the wet ground with the hard end of his brush, a technique that he had first used in the portrait of Mademoiselle Landsberg. Ten photographs taken over the three months that Matisse worked on the picture (now in the Museum archives) prove that the work underwent many variations during the course of its making. The earliest version of the picture shows a comparatively naturalistic composition, full of detail and depth, of a woman leaning to her side. Only gradually did the final state evolve, with its flat picture plane, inexpressive portrayal, and boldly exaggerated right hand encircled with beads. The model for Woman in Blue was Lydia Delectorskaya, a beautiful young Russian émigrée who worked for Matisse during the last twenty years of his life. The sumptuous violet-blue dress was one that Lydia herself made out of fabric that Matisse bought in Paris. The resulting concoction, which appears in several paintings of this period, was intended to be worn only in the studio and was held together by loose stitches and pins. Matisse's lifelong love of fabric and his expertise at capturing its colors, textures, and folds might be traced back to his childhood in Bohain-en-Vermandois, an industrial town in northeastern France, which was at that time an important center for the textile industry. Twentieth Century Painting and Sculpture in the Philadelphia Museum of Art (2000), p. 78. Acquired from the artist by Paul Rosenberg, Paris, 1937; with Rosenberg & Helft, London, 1937; sold to Henry P. McIlhenny, Philadelphia, July 1937; gift to his sister, Bernice (Bonnie) M. McIlhenny Wintersteen (Mrs. John Wintersteen), (1903-1986) Villanova, PA, July 1937 ; gift to PMA, 1956. 1. When asked by McIlhenny to recommend one of Matisse's figure paintings to purchase, the artist suggested his "Woman in Blue". See Rishel, Henry P. McIlhenny Collection, 1987, p. 68, and also correspondence from Paul Rosenberg, 1937 to 1938, in Henry McIlhenny Archives, object files (copies in curatorial file). Rosenberg was Matisse's dealer in this period.